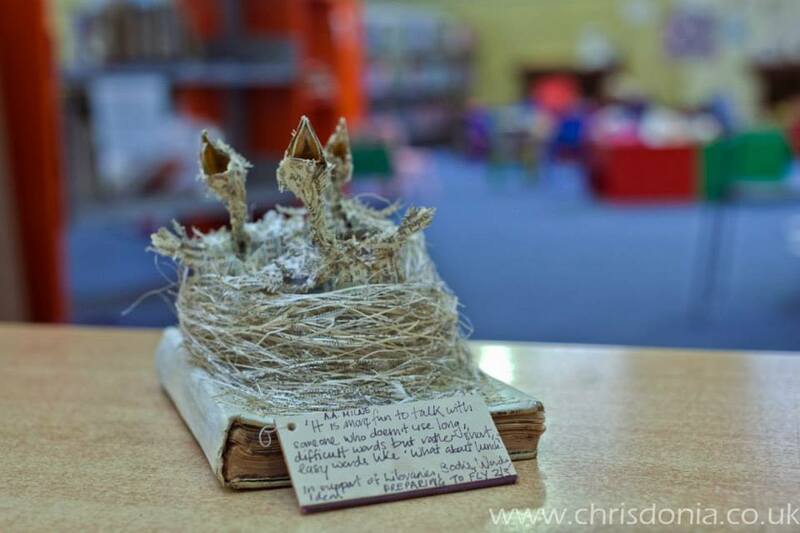 The mystery book artist of Edinburgh has secretly delivered another work — this time to the Leith Library, which boasts the community publication A-Z for Families in Leith with Young Children. Appropriately, the card that rests propped against a book beneath a nest of words and hungry baby birds quotes A.A. Milne’s Winnie-the-Pooh. Ironic that the sculpture’s appearance coincides this month with Sam Jordison’s review of Egmont Press’s Winnie-the-Pooh app. Thanks to Chris Scott, Literary Paparazzo, for capturing this reappearance.